Dealer Inspire’s Ana Bot tool engages with a potential dealership customer. At Jay Wolfe Automotive Group in Kansas City, Mo., customers sometimes come in and ask for Olivia. And though a few women named Olivia work at the dealerships, the customers are looking for someone else. They want to meet with a virtual assistant the dealerships use to respond to email inquiries. 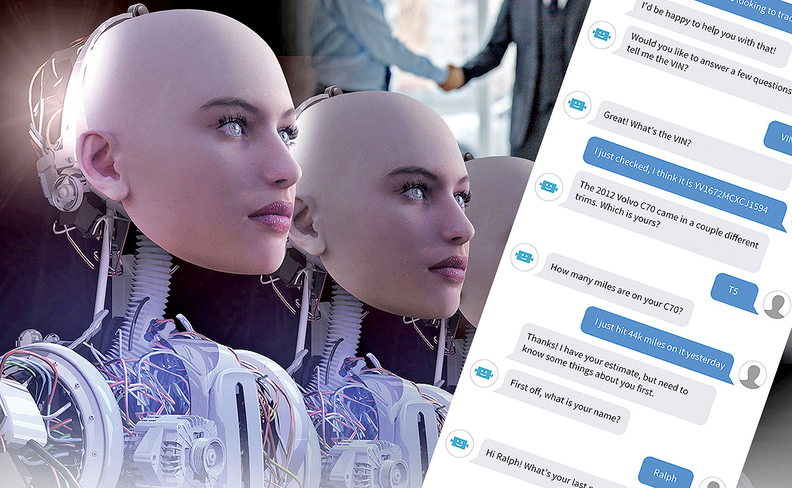 Olivia and other dealership virtual assistants — a more sophisticated version of the traditional chatbot — have been asked out for coffee and, in one instance, even received a bouquet of flowers delivered to a dealership as a thank you. "Because she has all the information about a particular person and is able to customize the interaction with them, they start to feel a bond with her," said Jill Whitehead, senior vice president at Dominion Dealer Solutions, a retail technology company in Norfolk, Va., that offers the Olivia technology to dealerships. Olivia tells her suitors she's too busy selling cars to meet for a coffee date. But the offers happen because advances in artificial intelligence mean virtual assistants are getting better at responding to queries. Dave Marod, general manager of retail for Conversica, a Foster City, Calif., company that offers the technology to dealerships, has seen customers send messages such as this: "At first I thought maybe you were a chatbot. Obviously, you're real. Sorry I haven't responded and thank you for your persistence." At dealerships in 2019, these virtual assistants, powered by AI technology, are often working in the background — by listening to calls and reading through emails, for example — to offer more personalized sales and service experience to customers. They can improve dealership operations by weeding out dead leads, intervening when a salesperson responds too slowly and even assessing customer emotions to let dealers know when they should try smoothing over upset feelings. On the other hand, if the virtual assistant makes a misstep, it can embarrass the dealership — if it even discovers the mistake happened. While it might seem like a positive for customers to make a connection with Olivia, Craig Misak, Jay Wolfe Automotive's director of dealer services, considers it a failure if someone comes in asking for her. That's because Olivia steps in if a sales rep fails to answer a customer within an appropriate time frame. Working closely with Olivia signals that the salesperson didn't respond to the customer quickly enough, Misak said. Many consumers would feel deceived to learn they were working with a dealership chatbot, according to an Automotive News-Cars.com survey. Q: Many dealerships use bots or virtual assistants when emailing with customers. If you learned you were working with a bot rather than a human before a service or sales visit, would it change your opinion of the dealership? Yes, I would feel deceived not knowing I was working with a bot all along. No, I trust the technology to quickly and efficiently address my needs. Yes, I am uncomfortable working with a bot. The tools work by mining data to create a customer profile so that salespeople can customize their interactions, listen to phone conversations to capture sentiment and details of the call, make appointments, share store hours and directions, estimate trade-in values, provide personalized offers and more. More than half of Facebook Marketplace shoppers who connect with Dealer Inspire's Ana Bot tool communicate with her when most dealerships are closed, between 6 p.m. and 9 a.m., said Joe Chura, CEO of Dealer Inspire, a Naperville, Ill., dealership technology provider acquired by Cars.com last year. "It's pretty cool when a customer [makes] a service appointment, and no one on staff touches it," said Kris Cox, Ana Bot user and CEO of Cox Auto Group in Bradenton, Fla. These virtual assistants go beyond a traditional bot. They are built into the dealership's workflow and integrate into the customer relationship management system or dealership management system. And they support two-way communication rather than simply responding to inbound queries. That's important as "dumb" bots are sometimes a source of customer frustration. In a recent example, one consumer's query to a local dealership on whether it serviced electric cars drew a response thanking him for his interest in "Make Unknown Model Unknown" and asking his timeframe for taking delivery. Needless to say, the dealership didn't win that consumer's service business. Conversica, founded in 2007, got into bots after dealers chasing Craigslist leads routinely said they were bad. Conversica then called multiple times, and, "lo and behold, the people were still in market. The whole business started trying to automate that," said Marod. The primary goal is engagement. If a dealership has 100 leads, only 20 may lead to a sale. "The problem is I don't know which 20, so I've got to work all 100 with the same intensity, and that's a lot of work," he said. Instead of employees contacting all 100, dealers can let the bot figure that out, he said. Less than a decade ago, bots were limited to "yes" and "no" replies, said Brian Benstock, vice president of Paragon Honda and Paragon Acura in New York City. Today, Benstock uses voice-enabled assistants through Google to schedule service appointments and pickups and deliveries. Automating such tasks gives employees more time to focus on serving customers better, he said. Benstock wants to be ahead of the curve of consumer expectations for such services: "Let's build the pipes, so the future we know is coming — we'll be able to handle it." Salespeople initially felt threatened by AI assistants reading emails and listening to calls, Marod said. But the tools can save a sale. Conversica's assistant routinely follows up and sometimes finds a customer never heard from the sales rep because the message ended up in a spam folder. That's a chance to reconnect. Virtual assistants become smarter over time and with consistent use. Ana Bot user Cox said early on "Ana was an infant. She had to be taught how to interact with customers and detect emotion and know when to say, 'I can't answer that question; let me find someone who can.' "
When a customer contacts the dealership asking for the assistant by name, the receptionist may identify her as an after-hours employee or acknowledge that she is a virtual assistant. Some dealerships name the assistant after an actual employee. But as virtual assistants correspond with customers more and more, some dealers and vendors are pondering the ethics around disclosing the situation. According to an Automotive News-Cars.com survey of consumers conducted this month, nearly 40 percent of respondents said they would feel deceived to find out they'd been working with a bot. Misak, the dealer using Olivia, said one customer did a reverse image lookup of the photo of Olivia on the store website and was disheartened to learn it was an image of a model instead of a store employee. Misak has since removed the photo from the website. Dealers using Conversica's tool make their own call on disclosure. "As we are getting more and more chatbots out in the world and people are used to using them, I don't feel like it's as big a deal anymore to let people know that they are talking to an AI assistant," said Marod. Still, only a small percentage of Conversica clients tell the customer the assistant is virtual, he said. With Ana Bot, up to 70 percent of dealerships tell customers they are talking to a bot from the start, said Dealer Inspire's Chura. When Cox first began using Ana Bot, he "quickly discovered we needed to refer to her as Ana Bot so the consumer knew exactly what was going on." Besides transparency, a benefit is letting customers know Ana Bot could transfer them to a live agent if she was unable to help. And at least for now, as virtual assistant tools gather more data and intelligence, they'll still pass the sales team the baton, rather than taking their spot in the race. Said Cox: "It's really a beautiful relationship of how automation and human interaction works."